2012安道尔金鹰F15密印精制银币 Add this special edition Andorra Golden Eagle silver proof coin to your collection. It was released as part of the Fabulous 15 collection for 2012. The obverse features the Coat of Arms of Andorra, as well as the denomination of 5 diners. 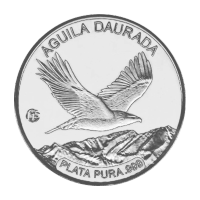 The Andorra diner is a currency created specifically for use on collectible coins. The reverse displays a golden eagle soaring over mountains, as well as the F15 privy mark. A wonderful addition to any wildlife themed collection, buy yours today!